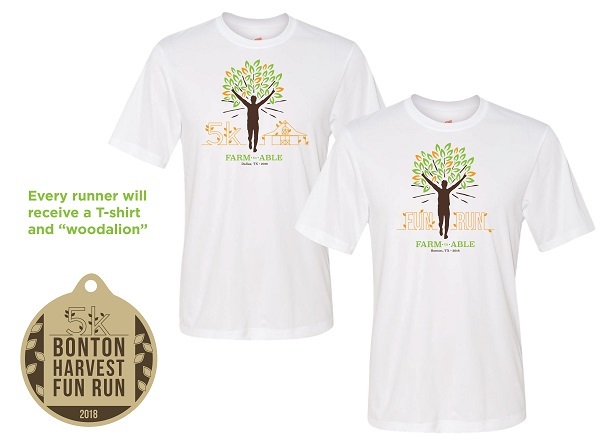 Every pre-registered participant will receive an official Bonton Harvest 5k T-shirt and swag bag. T-shirts and swag are not guaranteed for late or race day registrants. 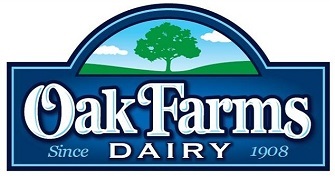 The Race Course will start and end near Bonton Farms in Dallas, and Finisher Festivities will be held at Bonton Farms. This year’s THEME is Farm to Able. 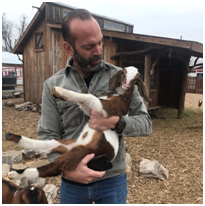 It signifies the full journey of Bonton Farms, and their founder Daron Babcock, who started a farm that turned into family in the most unlikely circumstances. Farm to Able emphasizes how far they have come by being able to work together on a farm and take care of each other in the process. It is also a message for all of us to always believe that we are able – that we have the power, skill, means, and opportunity to do anything we set our minds to. Join us November 10 and go Farm to Able. This year’s GOAL is to raise enough money for Bonton Farms to build a new barn. The barn will provide a secure place to store and preserve equipment, a place to work in inclement weather, and will house a “caretaker” who will provide security for the farm as well as additional housing to meet the needs of those we serve. For guests, it will have restrooms and be a place to hold events that will bring revenue to the farm. With your donation, we can raise the bar by raising the barn. For more than 40 years, Spencer + Company has partnered with industry professionals to help realize their clients' workplace design and furniture needs. We’re a team of passionate collaborators, experienced, knowledgeable and deeply committed to delivering innovative, turn-key solutions that meet the demands of a diverse and ever-changing workforce. We strive to elevate human potential by creating workplaces that improve employee engagement, collaboration and innovation — generating prosperity for our clients and contributing directly to their long-term success. Above all, we believe in the transformative power of place. Visit spencerandco.com to learn more. PepsiCo Food for Good is a purpose-driven business initiative that tackles child hunger by making nutritious food more physically and financially accessible for low-income families. By leveraging PepsiCo’s expertise in taste, nutrition, and distribution – as owners of the country’s largest “food-moving fleet” – they are able to help reach underserved families in the United States. Through grants from the PepsiCo Foundation, Food for Good has supported scalable efforts of Bonton Farms to provide job opportunities and sustainable agricultural solutions for food insecure communities. The Bonton Harvest 5k Fun Run is an endurance race in the urban food desert of Bonton, TX. Please plan to arrive 30-60 minutes early to allow yourself plenty of time to park, grab your Bonton swag, check-in, pet some goats, and get situated. Join us in the morning for breakfast and snacks, and stay for lunch, refreshments, goats, photos, and other finisher festivities following the race. You don’t want to miss this inaugural event with proceeds going towards Bonton’s new barn. In the South Dallas neighborhood called Bonton, you don’t expect to find a farm. You expect to see crime, drugs, and gang violence. But all that is changing thanks, in part, to Bonton Farms. Bonton is located in a “food desert” where 63% of residents lack personal transportation and the nearest grocery store is a 3-hour round-trip bus ride. So instead, they go to one of the many beer and wine stores to purchase overpriced, processed foods. The impact to their health is devastating. Bonton has roughly double the rate of diabetes, cancer, stroke, heart disease, and childhood obesity than the county they are in. And that’s not ok! We believe that the Bonton neighborhood should change from within, driven by their own people, using their own hands. So, Bonton Farms was launched. Today, they are cultivating a sustainable and vibrant urban farm that utilizes the most innovative urban gardening techniques available. For more than 40 years, Spencer + Company has partnered with industry professionals to help realize their clients' workplace design and furniture needs. We are dedicated to elevating human potential through the creation of inspired workplaces that improve employee engagement, collaboration, and innovation. 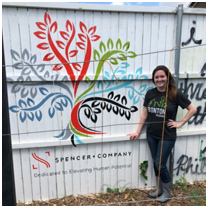 Spencer + Company is committed to the health and vitality of our community and partner with local organizations who elevate human potential, such as Bonton Farms. Our missions truly align, and rather than simply donating to the cause, we have chosen to “adopt” and invest our time, money, and resources in Bonton Farms. 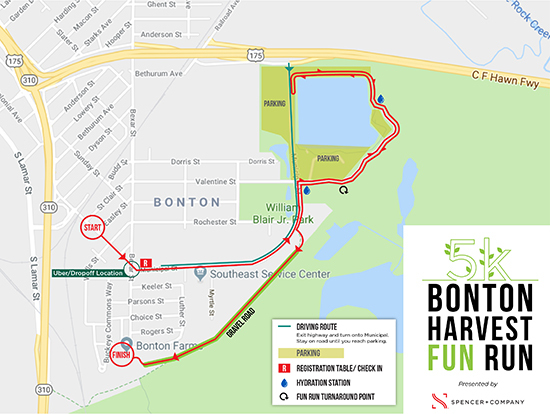 We are proud to have established the Bonton Harvest 5k Fun Run. The 5k was chosen as our annual event due to the staggering statistics of the Bonton residents living in a “food desert” and having no option but to eat over-priced, processed foods rather than a healthy balanced meal. Bonton residents have roughly double the rate of diabetes, cancer, stroke, heart disease, and childhood obesity than the county they are in. The 5k is a chance for Bonton residents to embrace health and wellness, encourage kids to participate in the 1-mile fun run, and learn about healthier, farm-fresh meal options in their own neighborhood. Spencer + Company is also working on furnishing their soon-to-be-open market as well as developing a furniture solution for their future planned school. Jenna was born in Fort Worth, TX, but raised in Japan, Fort Worth, and South Korea. Despite the inevitable sunburn, she’s always been a fan of hiking and being outdoors. Since January, Jenna has served as Junior Art Director for Spencer + Company. After going out to Bonton Farms for the first time in February, hearing their story, seeing the people, and getting to cuddle with some baby goats, she was sold! With 8 years of graphic design experience, she is committed to using her creative abilities to tell stories and make people happy. Jeff has been a project manager at Spencer + Company for 11 years. He was raised in West Texas and spent the formidable days during the summer working on horse and cattle ranches. He was immediately drawn in by the Bonton Farms story and the path Daron took to get it off the ground. Mental and physical wellness is a major focus for him in my everyday life. It’s at the center of the human spirit and makes for a happier existence and spreads hope. Running and being outdoors is a major component to Jeff’s life. 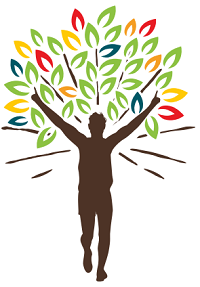 He is committed to sharing his experiences with people and to help them be a better version of themselves. Caroline brings 13 years of design experience to Corgan’s interior design team. 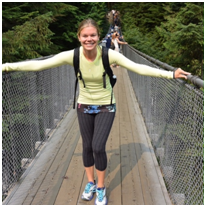 She splits her time between business development, project management, and chatting about wellness in the workplace. 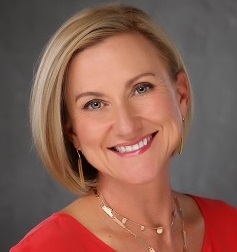 Caroline is involved in various causes she is passionate about, some of which include serving on the Bonton Farms 5K Committee, active member of the Dallas Junior League, active member of The Real Estate Council (TREC) Associate Leadership Class of 2018, and a volunteer at the Senior Source. Her most recent cause, Bonton Farms 5K, was especially important to her as she can align two of her favorite things: running and people. In her spare time, she enjoys running marathons across the country with her sister, international traveling, working out with her boyfriend, Horned Frogs football and walking her Labrador Retriever, Stella. 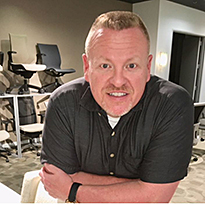 Senior Account Manager, Shaw Inc.
Cari Johnson is a Dallas native and has been working in our local market for 20 years. Cari has been an account manager with Shaw Contract for 7 years. 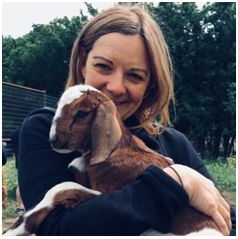 Shaw was introduced to Bonton Farms through Bethany Moon with Feed Thy Neighbor and has been a supporter of Bonton Farms and Feed Thy Neighbor since 2017. Cari has been profoundly inspired by the rich history of the neighborhood and God's servant leaders that work and live there. Oh, and don't forget the precious baby goats! Cari wants to help share the story of how Bonton Farms is changing lives! Lisa was born and raised in Memphis, TN and north MS. She moved to Dallas with her husband of 28 years 4 years ago and started working for Haworth in April of 2018. Lisa had been volunteering with the Dallas Arboretum and received her food safety certification as well, since she was working in the tasting garden at the Arboretum. After hearing about the incredible services that Bonton Farms offers their community and the opportunities to provide support, she had to be a part of this organization! Gardening may not be in her bones, but farm to table food, preparation and serving underserved communities is definitely in her blood! 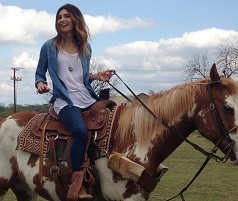 No stranger to farms, Jessi grew up riding horses in Flower Mound, Texas. She first visited Bonton in 2017 and felt immediately connected with the people in the community while passing out meals at Thanksgiving. She took her desire to help the Bonton community and assisted in organizing Shaw Contract's holiday fundraiser for Feed Thy Neighbor, a local food pantry. Jessi is excited to continue spreading the word about Bonton Farms! Emily is an Arkansas native who spent the first 18 years of her life swimming in lakes throughout the Natural State, hiking the Ozark mountains, and admiring its beautiful landscapes from small cabins in the middle of nowhere. She feels guilty anytime she stays inside on a pretty day. Emily decided to venture to Texas in college to become a Horned Frog, which is where she found her joy in helping others. Her favorite activities included volunteering for Make A Wish and at the local homeless shelter. 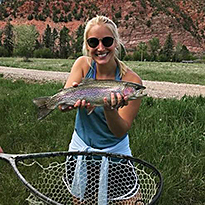 Combining her love for the outdoors with her eagerness to help others, she is excited and committed to help evolve the Bonton Farms program and the lives of those who are directly impacted. When this page loaded, the official time was 8:22:16 AM EDT.